All LED TVs are actually LCD TVs, they just use LED (light-emitting diode) as their light source instead of CCFL (Cold-cathode fluorescent lamp). Both LCD and plasma can produce beautiful images, but they have different characteristics. One is not necessary better than the other. It’s a personal preference as to the type of image you want to see, along with the size and cost factor. Compare the two side by side in the store to see what you like best. LCDs screens have a matte finish with minimal reflection. They also have a better image quality and higher resolution at smaller screen sizes than any other display technology and tends to be brighter than plasmas. Without question, LED LCDs are the brightest TVs you can buy and they have the lowest energy consumption, especially when you turn down the backlight. It has a very realistic look, natural balance, superior color accuracy, good flesh tones, and sharpness. The screen size for an LCD can vary from 2 inches to 90 inches. LCDs weigh about half as much as a CRT television with the same size screen. They are popular in places where there is not much space. They can be desk, cabinet or wall mounted. Almost all flat panel televisions have a widescreen format. Many flat panel TVs include a PC input. If you have PIP (picture in a picture), you can watch TV while searching the web! 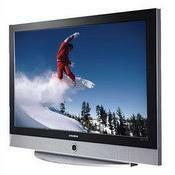 Almost all flat panel televisions can display high-definition (HDTV). Many tube (CRT) televisions cannot. The picture is brilliant and easily viewable in all lighting situations. They have a wide viewing area and allows for undistorted viewing from most angles. They tend to have better audio systems than the old televisions had. Flat screen TV prices have really come down in the last couple of years and probably will continue to do so.